When it comes to remodeling your Kitchen sink you will definitely consider getting a kitchen Faucet and while you are at it getting a good kitchen faucet is crucial. When you enter the kitchen you know that it is the sink and its faucet that instantly attracts your attention. So you must be extremely careful when you are getting new ones for your kitchen too. Earlier the kitchen sink was used to wash the dishes, the vegetables and other utensils related to cooking.But with technological innovation gaining prominence you will be stumped by the new varieties of kitchen faucets. The enhanced functionality of the faucets will certainly win your approval. Whether renovating the kitchen or simply doing some selected updating of features, consider the Delta Leland 9178-SS-DST faucet as part of the plan. This stainless steel faucet is a pull down design with a single side lever that allows one-handed control of water temperature and flow. Its high arc swivels 360 degrees to get to every corner of the sink. The Delta Leland 9178-SS-DST has a design reminiscent of teapots, a charming touch to the kitchen. The 59-inch pull down hose reaches for 20 inches. The optional escutcheon allows for one to three hole mounting, so dish detergent and hand soap can be at the fingertips yet out of sight. The faucet features magnetic MagnaTite docking for a secure fit. This means the faucet has a powerful magnet that keeps the faucet in place when it’s not in use. No longer will an unused faucet dangle from its dock. Like all Delta faucets, this one comes with rubber nubbins at the source of water flow. These nubbins wipe clean with a touch of the finger, to remain free of calcium and lime deposits. Imagine being able to wipe a faucet clean at a touch! Delta is well known throughout the industry for its high quality faucets and showerheads. Homeowners know Delta for its washer-less faucet design that doesn’t leak. Delta’s technological advances give the Delta Leland 9178-SS-DST faucet the most up-to-date features available. The faucet is compliant with the Americans with Disability Act, the ADA. Some local codes require that new construction or renovations are ADA compliant. It’s also in accordance with the special regulations required by the states of California and Vermont, specifically California AB 1953 and Vermont S152 state laws. The Delta Leland faucet has Delta’s exclusive trademarked Diamond Seal valve, an innovative water delivery system. It’s an internal contact surface made up of tiny diamonds; these render the valve leak-free and extraordinarily durable. It also keeps water free from metal contaminants. As with all faucets made by Delta, the Leland faucet comes with a lifetime warranty. There’s a limited warranty on its finish. The faucet’s flow is environmentally friendly at 8.3 liters per minute; that’s a bit over 2 gallons per minute. This rate meets CALGreen standards for water flow rates. The total spout height is 14 and 7/8 inches and the spout length is 9 and 1/8 inches. Everything has drawbacks, the Delta Leland 9178-SS-DST faucet included. It’s tall so the kitchen has to have sufficient clearance for it to be installed. The bright finish might not match if the homeowner has or prefers the brushed stainless finish. The Delta Leland 9178-SS-DST faucet is available from a wide variety of sources all over the country. Be sure to buy a Delta Leland 9178-SS-DST faucet right away. The design of this faucet also looks quite functional. The stainless steel body and single-lever handle are quite easy to monitor as well. The handle is light and compact. You can also fit a soap dispenser to the faucet. The Danze D455158SS Faucet has ceramic containers, where the water will flow in from the pipes and ducts. This container is made strong so that there are no leakages or spills of water from the dense network of pipes and ducts. So, thus, the Danze Faucet helps a lot in saving wastage of water. The Danze faucet is a machine that is also quite economical and eco-friendly as well. The thing also looks quite stylishly conceived as well. The Danze Single Handle Faucet has been designed so as to fit even the corners and narrow crannies in your kitchen space. So, everything will look orderly and well-organized with the neat arrangements of your kitchen faucet and basin taps. We will now see the main attractions in this faucet. The Danze D455158SS Single Lever Handle Faucet has a super-capable spout. It is about 10 inches long. The spout also has an easy to use ceramic spout disc as well. This disc can be rotated easily without any interruption. So, you can use the water flow with great and incredible ease. Moreover, you can also choose between two modes of water flow. One is the spray mode. This will be ideal for most of the demanding washing and rinsing chores. The other mode is the aerated steam mode. This mode will be for some of the regular rinsing and washing tasks. So, you can use these two modes for greater ease in washing and rinsing your utensils and hands as well. Therefore, it will be handier for you to use the two modes of water flow. Go buy the Danze 455158SS Faucet now! What really amazes us about the Kraus Kitchen Faucet and Dispenser is its stylish and groovy looks. The entire thing is slimmer than your thumb. So, when you install the Kraus KPF-1602-KSD-30CH Faucet on your kitchen sinks, it will not look ugly. Moreover, this system from Kraus will also have a smooth and trendy chrome finish on the surface. So, whether it is glitzy white basins or darker tones, the chrome look will be spectacular. Moreover, the water will be stored in a glossy ceramic cartridge. From this cartridge, the water will flow into the faucet and then into the hose. Earlier, I had mentioned that the Kraus KPF-1602-KSD-30CH Faucet and Soap Dispenser works rather flexibly. This is because the faucet has an adjustable hose. The hose can be rotated around in 180 degrees. So, this means that you can set up your hose according to your comfort and convenience as well. The Kraus KPF-1602-KSD-30CH also has an in-built soap dispenser. This dispenser has the same features as the water faucet. The soap dispenser is built with the same solid brass material. It also has the similar stylish and shiny chrome finish on its surface. So, the soap dispenser’s stylish frills suit the overall look very amply. Moreover, the liquid soap has to be stored in a stylish container as well. You can also use the soap quite flexibly. The hose tap can be turned in a 360 degree angle. You can thus get a quick flow of the soap on your hands. You can also fill up the soap dispenser with detergent and water. With the effective flow adjuster, you can even wash and rinse your utensils in the kitchen sink. However, a minor niggle is that the soap dispenser tap does not turn quite smoothly. You have to exert some extra force. However, despite this, I advise you to buy the Kraus KPF-1602-KSD-30CH at once! The Moen 7594CSL Arbor Pull Down faucet is the faucet of choice for those who love a timeless classic with the ease of a single lever faucet. Made of polished stainless steel, it’s the perfect match for today’s sinks and appliances. The Moen 7594CSL has a pullout spout featuring Moen’s exclusive trademarked Reflex system. The three-function sprayer is superior to many other faucet sprayers. With this faucet, users have a choice of an aerated stream, a powerful rinse or a pause. The faucet gives the users smooth motion and easy docking. The faucet can take up to three holes in the escutcheon, so reservoirs for detergent and hand lotion can be added when the faucet is installed. In addition, this faucet is complaint with the Americans with Disabilities Act. Moen put a lot of research into the Reflex system to make it the user-friendliest faucet of its type. Moen asked for input from faucet users and used the feedback to help in the design process. There’s an ultra-flexible hose in the Moen 7594CSL, one of the features users desired. The spray wand’s range of motion is the broadest among faucets. The faucet pulls down easier than any other faucet of this style, another feature people wanted. It has a powerful spray but limits water consumption to 2.2 gallons per minute, a feature every environmentally conscious consumer wants. The Moen 7594CSL is easy to install too. Moen’s original patented Hydrolock installation system allows water line connection to be fast and easy. Do-it-yourself homeowners will appreciate the easy installation. Hiring a plumber will cost less because installation of this faucet is so easy. Few or no tools are needed, in fact, for installation. The connection size is 3/8 inch and faucet takes a compression connection. The supply length is 32 inches. The spout height is 15.9 inches. The hose length is 68 inches. The faucet is backed by Moen’s limited lifetime warranty against leaks, drips and defects to the stainless steel finish. The only drawbacks one might note is that the transitional style of the faucet might not match a traditional or country kitchen decor or one might prefer matte stainless steel to the polished finish of this faucet. It’s not necessary to renovate the kitchen in order to update the faucet to the Moen 7594CSL. With installation so easy, simply take out the old faucet put the Moen in its place. Buy the Moen 7594CSL Arbor Pulldown faucet today and make kitchen chores easier. If you are redesigning your kitchen, chances are you probably want a new sink and faucet, in which case you need to consider the American Standard 4332.350.075. If you want something out of the ordinary and not you standard faucet, this American Standard 4332.350.075 might just be what you are looking for. There are a series of features you don’t find on a standard faucet, so make sure to take the time to look over the product and the equipment. Just make sure though to consider both the pros and the cons before buying the faucet, as you want to fully understand and know what you are getting into, before you go and buy the equipment. The American Standard 4332.350.075 is a semi professional, single control kitchen faucet, constructed out of brass with a stainless steel finish. The sink is rather heavy at nine pounds, although it is held up firmly, so you shouldn’t have issues with the equipment standing. The faucet is a brass body swivel spout with an attached swing arm, so the hose becomes detached, allowing you to move and adjust how you spray the water. There are several, adjustable spray patterns with the faucet, allowing you to adjust your control depending on how you need the water to perform. There is a protector coil wrapped around the hose, as it is exposed, so there is no risk in damaging the hose. It ensures the hose is properly wound and stays in place, regardless of its placement. The American Standard 4332.350.075 is also controlled with a metal handle, instead of a button, which many faucets are now controlled by. This allows you to freely adjust the amount of water that is produced by the faucet at all times, so you never waste any. The American Standard 4332.350.075 is designed for the professional cook at home, so if you love to cook, the American Standard faucet is perfect for you. With the stainless steel finish you never need to worry about the product rusting, and it always is going to look its best. Plus, with the protective coil around the hose, you don’t need to worry about potential damage to the house, plus it adds a touch of elegance to the equipment. The handle is easy to use and allows you to adjust the water flow of the faucet, which is more than most other faucets offer now days. And with all the different spray patterns, you are able to perform just about any task imaginable with the equipment. There aren’t many downsides with the American Standard 4332.350.075. The faucet functions well and there are very few complains in regards to the equipment from individuals using it. The main issue is the price. Depending on where and when you purchase the material it is going to cost you a few hundred dollars, if not more. If you don’t want to spend this much money, or if you don’t have this much money on hand for a kitchen faucet, you need to go with a different device, as there are many out there that aren’t going to cost you this around of money. 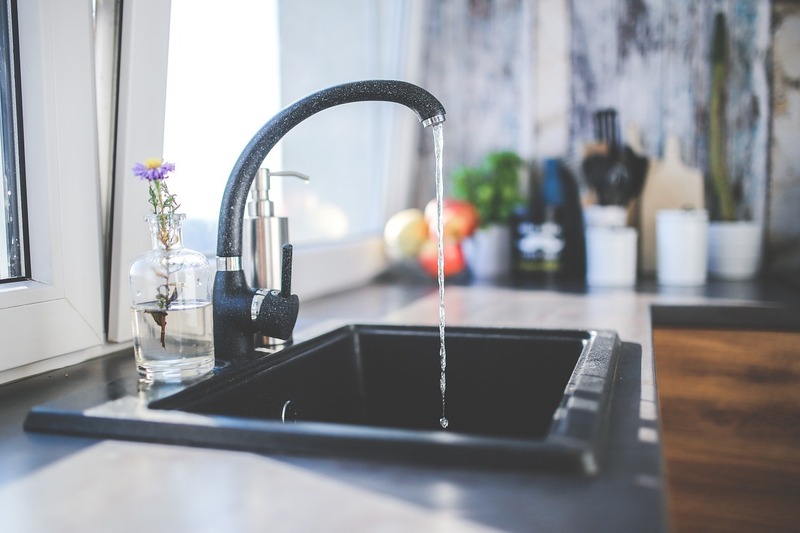 Just like anything else, there are a couple of things you need to mull over before your spend money on a new faucet for your kitchen. In a bid to help you buy the best kitchen faucet to meet and hopefully exceed your expectations, here is a comprehensive buying guide outlining all they key considerations you need to make. If you’re swapping an old faucet with a new one, go for a unit whose deck has the equivalent number of holes to one that’s being replaced. Faucets whose handles are fixed to the faucet and spout require three holes; the handle and spout take two holes while the sprayer takes the remaining hole. Conventional units with two taps need four holes; three are taken by the tap together with spout while the fourth hole is used by the sprayer. You can decide on how many holes you want in the sink depending on the type of faucet you want if the kitchen is new. Faucets found in most kitchens come with handles that rotate in a particular direction to allow you determine the water temperature. Some models have two handles that are used when mixing water with varying temperatures. For a one-piece faucet, a unit whose handle is connected to the faucet would make an excellent choice. Alternatively a faucet whose handle located to the side just like a conventional sprayer would be ideal. If you want to buy a traditional faucet, you may go a unit that has the antique rounded “X” shaped tap or a modern cylindrical silhouette or the easy-access lever shape. The easy-access lever taps are convenient, easy to use and go well with modern kitchen designs. They are perfect when you want to install a faucet that will be accessed and used by everyone in the house irrespective of their physical ability. Drinking water used in many households is filtered before it is declared safe for drinking. The choice of whether to buy a unit that comes with an integrated filter or not depends on the capacity that needs to be filtered and the maintenance requirements. Not all models come with in-built filters but even then most allow for attaching a filter to the main faucet. The best kitchen faucet is the one that complements your kitchen’s cabinet hardware. Go for a unit that’s not only pleasing to the eye but is also stylish and has a unified look. The finish should be smooth, and the construction materials should be durable. While style and finish are important, the ultimate decision on the style and finish boils down to your taste and preference. You can choose the unit that has more appeal to you, but be careful not to compromise on any of other considerations stipulated here. A lot of vigorous kitchen activities occur in the faucet on a daily basis. Thus, it goes without saying that frequent repairs are imminent if you are to maintenance the faucet’s functionality. Buy a unit that is not only easy to install, but to repair as well. Get additional screws and a screwdriver to be used later in the repair. While most faucets hardly leak, the manufacturer will give the replacement part for you to fix the unit in case that happens. It is, therefore, important that you read the installation manual carefully so you can handle future repairs with relative ease and most importantly handle them correctly. Models that have straight spouts are not only small but relatively affordable as well. However, you might be forced to move the unit to accommodate the big pot located beneath it. Go for models that give high clearances in addition to offering adequate splashing if the sink is shallow. The faucet’s swing is also imperative. You need to go for a unit whose swing is can cover the full length of the sink particularly if you are buying two bowls or wide sink. Go for a moderately sized sink as a big one doesn’t look so appealing. One of the surest ways to know if a product is worth buying or not is by reading what others have to say about it. The best kitchen faucet should attract positive and high ratings from previous users. Getting a second opinion about a product helps you make an informed buying decision. The best places to read about a product’s customer reviews are on the manufacturer’s website or online retail stores such as Amazon. Most of these reviews are honest and unbiased. It is, needless to say that the best kitchen faucet is the highly rated and positively reviewed unit. Trusted brands will always make quality products. Before you settle on any particular unit, you need to make a comprehensive research on the most popular brands. You may consider digging into the manufacturer’s history as well and the number of years the company has been in existence. Top kitchen faucet brands include Kraus and Delta. In the event that you don’t know which brand to go for, conducting a “top 10” survey on the internet would come in handy. You can use the warranty period to help you determine the best kitchen faucet. If a manufacturer trusts in the quality of their product, attaching a long warranty should not be a problem. Units with long warranty periods are likely to be of high quality and are worth buying. You also need to inquire if the warranty has any limitations such as geographical location to know if you are covered and if so up to what extent. A kitchen faucet is an important investment and the need to buy the most appropriate unit needs no emphasis. With so many brands and models in the market today, choosing the best kitchen faucet can be a daunting task. However, the teed-bits provided here ensure that you buy the best possible unit.